Sanbi-chiku refers to the region spanning Okayama and Hiroshima prefectures, where many of Japan’s textile producers are concentrated. Kojima in Kurashiki city in Okayama prefecture has numerous apparel and sewing factories that produce uniforms for workers and students and denim clothing, as well as washing and processing plants, while Ibara city in the same prefecture is known for its denim materials and sewn products. And in addition to its factories for sewing and work and casual apparel, Fukuyama city in Hiroshima prefecture also produces plenty of denim materials. Although many travellers visit these prefectures for their major sightseeing destinations of Kurashiki and Onomichi, the production areas there also have a variety of speciality products and places. Kojima Jeans Street is what first comes to kind when mentioning Kojima. Initially the street didn’t have many denim shops, but now it has become Kojima’s main shopping street with around 40 such stores lining it. We recommend enjoying some udon noodles for lunch while your there. Kojima is a coastal town situated along the Seto Inland Sea. It faces Shikoku’s Kagawa prefecture, which is famous for its udon noodles. 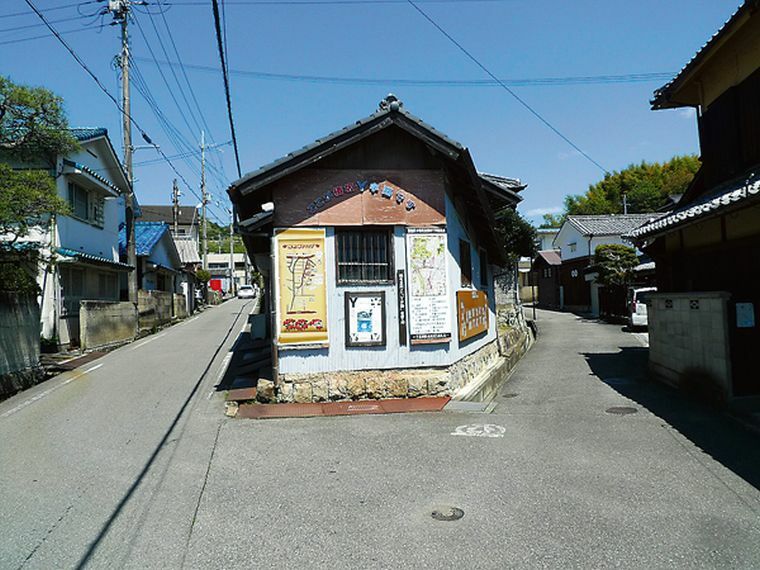 In the past, many people from Kagawa travelled to Kojima to earn a living by running udon stores; so since then, Kojima has many places selling udon. 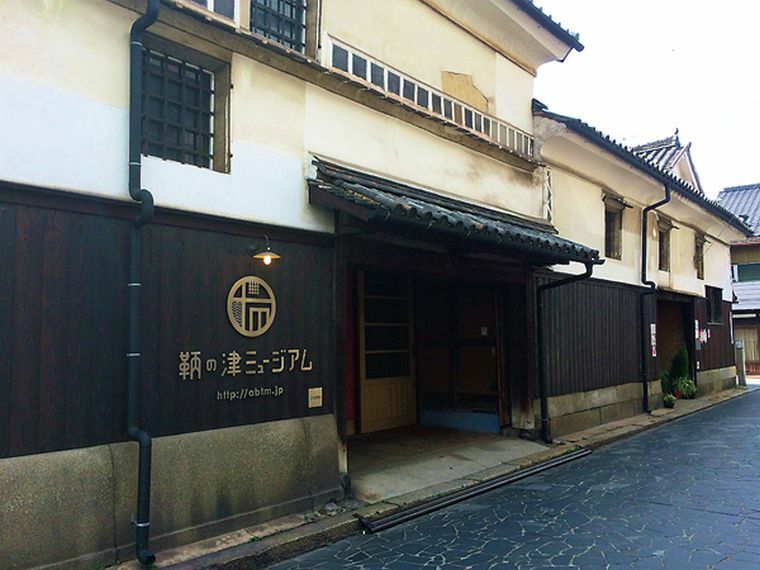 One example is Baisou, which is a tasteful building that is also a registered tangible cultural property. 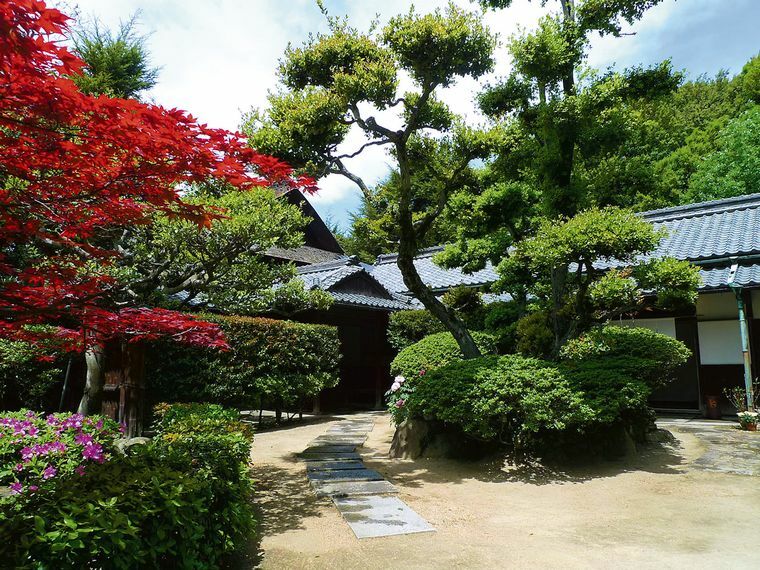 Originally built in 1902 as a holiday home, Baisou was carefully constructed over more than two years and includes a Japanese garden created by carpenters called in from Kyoto. The udon noodles are freshly boiled for each order, and they are made using only domestically-grown wheat. A bowl of udon here is an exquisite meal of deliciously chewy noodles that go down smoothly. 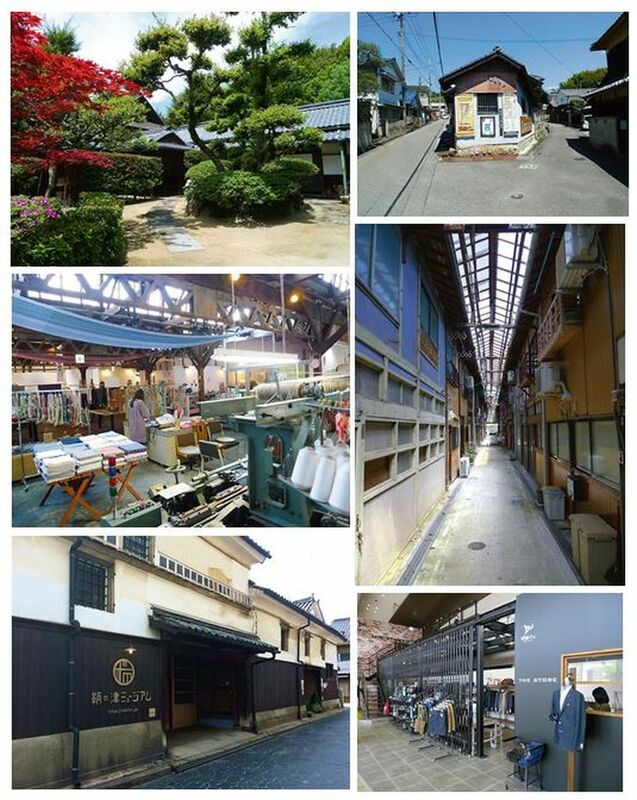 Ibara city in Okayama prefecture is home to numerous denim manufacturers and factories for sewing and other processes. 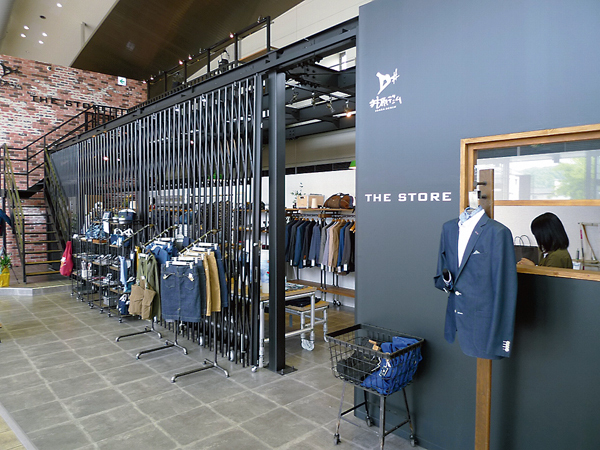 The revamped Ibara Denim Store in front of the station now has a shop, workshop and museum. In addition to stocking a range of local brand jeans, denim yukata (summer kimono) and other goods, the store also has a studio where denim items can actually be made. It runs workshops and other events at the studio, which has sewing machines and other equipment that participants can use to make a pair of jeans or other items using locally produced textiles. The store also functions as an information hub on denim by featuring videos on vintage jeans and their history. The Tomonotsu Museum in the Tomonomura port area is about 30 minutes by bus from Fukuyama station. This distinctive museum mainly researches and exhibits an array of creations produced by unconventional methods that “deviate” from the usual aesthetic norms. It’s basic philosophy is to “create opportunities for visitors to come into contact with perspectives that must be shown to the world, and in doing so hopefully help realize a society where people recognise and respect each other’s existence and diversity.” It also exhibits expressive works of what is generally referred to as “outsider art”, such as those created by people with disabilities. BICHU&BINGO JAPAN DENIM PROJECT: This project aims to promote denim in a collaborative effort by the public and private sectors in the denim production areas of Fukuyama city in Hiroshima prefecture and Ibara city in Okayama prefecture. It features online animated video contents called “denimation”, which explain the history of denim and how it’s actually made. The project introduces local businesses in the Bichu and Bingo areas that carry out processing, sewing, washing and other steps of producing denim, such as the spinning, weaving and dyeing of the KAIHARA Co., Ltd. and the rope dyeing of Sakamoto Denim Co., Ltd. It also runs denim tours so that people can see up close how denim is made and hopefully become more familiar with the fabric. The Project even holds a Bichu and Bingo Denim Contest for submissions of denim-inspired photos and illustrations. 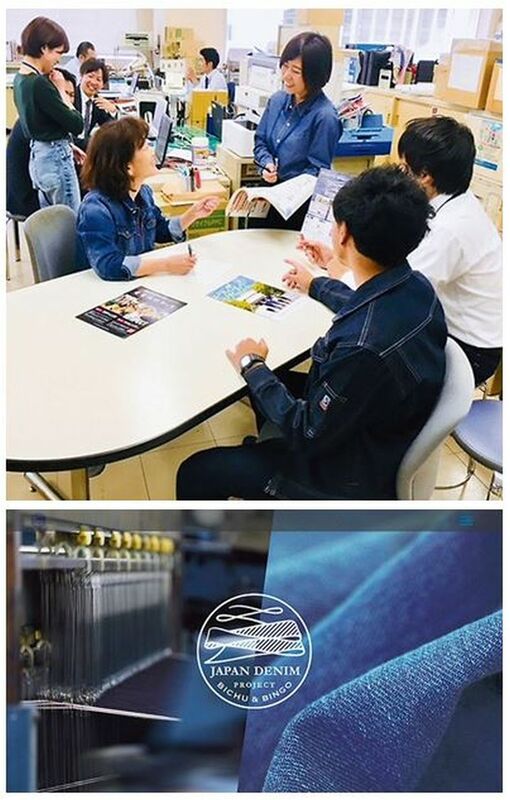 The public and private sectors are working together to promote denim from the Bichu and Bingo area via various initiatives, such as letting the staff at Fukuyama City Hall wear denim to work for a certain period if they choose to. The cotton textile production area of Nishiwaki city in Hyogo prefecture is known for its yarn-dyed cotton fabrics with gingham checks and other patterns. The city’s mayor recently launched the Nishiwaki Fashion City Vision in an effort to support and encourage young designers to move there. The famous designer Niime Tamaki lives in the city’s production area, where she has set up a combined studio and shop. Nishiwaki has lush natural surroundings and a beautiful river running through it. The city is situated just east of central Hyogo; it’s about a one hour and forty-five-minute bus ride from Osaka. Tadanori Yokoo is one of Japan’s leading and must-know graphic designer and artist, and also a Nishiwaki native. Many of his most famous works featuring Y-intersections have been inspired by the actual Y-shaped intersections scattered throughout Nishiwaki. It’s also fun to walk around the city while searching for these Y-intersections. Another must-see while in Nishiwaki is the Okanoyama Museum of Art Nishiwaki, which is right near the Nihon-Heso-Koen Station. It opened in 1984, originally as a space to exhibit works by Nishiwaki native Tadanori Yokoo and promote community activities. The building was designed by architect Arata Isozaki, who created an exterior that resembles a three-carriage train stationed at a platform. Although the museum currently does not have any permanent exhibits of Tadanori Yokoo’s works, the exterior features his porcelain tile wall fresco. The Okanoyama Museum of Art currently exhibits works from various contemporary artists. Banshu-ori was once a pillar of Japan’s textile exports. In its most recent period of prosperity in 1987, the annual production of Banshu-ori peaked at around 390 million square meters of cloth. The city also thrived then, as evidenced by its many movie theatres and bowling alleys for the locals to enjoy. Nishwaki still has buildings with sawtooth roofs and other design elements that recall its prime period. 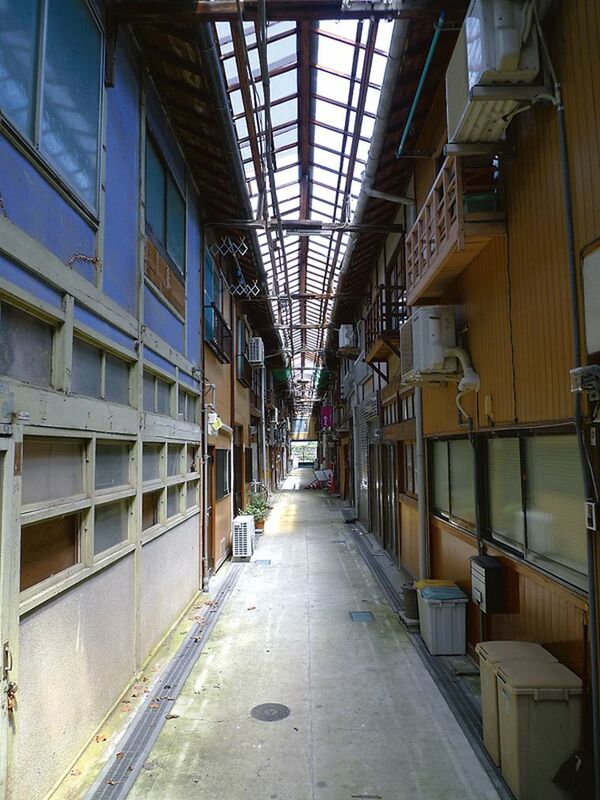 One example is the wooden arcade Asahi market, which was once a communal lodging house for women working at Banshu-ori factories from the end of the Taisho period to the beginning of the Showa period; it is still used a lodging house even today. We recommend trying the Nishiwaki ramen, which has been sweetened to suit the palate of working women. 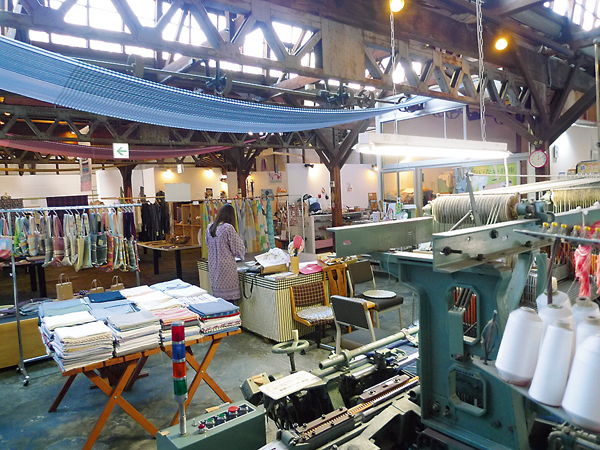 The Banshu-ori Kobokan store is a refurbished factory that now sells a wide array of original and locally-produced products, including Western-style clothing, fabrics and various miscellaneous items. It also has displays of an actual rapier loom and hand loom, and a selection of pamphlets on the area and other local information; so it’s probably worthwhile to stop by and take a look inside. Banshu production area: Concentrated in Nishiwaki city in Hyogo prefecture, this is Japan’s largest production area for yarn-dyed cotton fabrics. It originated with the introduction of weaving techniques from Nishijin in Kyoto during the 18th Century. The area has many businesses that produce and sell woven fabric, do dyeing and processing, and deal in wholesale trade and other activities. It once flourished with the production of shirts for the US market, but now the focus has shifted to the Japanese market with domestic demand accounting for around 90% of the area’s total production volume.